1 – The roofing company indeed fought, saying that none of this was their responsibility. We called the contracting people from USAA that put us in contact with them as a guaranteed company. After a three-way conversation, the roofers said they’d come out to our house with a third party roofer to all discuss with us the damage and what might possibly their part in it. They were supposed to come out on Monday, but never showed, and when we called, they said maybe Tuesday. 2 – In the meantime, we looked up our old quote and invoice from the roofers a few months ago. Turns out, we paid them to fix and reconnect the siding on our house, as well as do a few things to the roof on the extension to the house. None of the stuff we paid for in that section was done. From inside the house, you can see the rotted underlayment and the flashing that they just put on top of a hole, and the siding is still disconnected, which is what caused the problem. So we prepped that to show the roofers when they finally showed up for our little rendezvous. 3 – While we waited for all that mess to get resolved, our contractor friend (James) began work on the master bathroom. 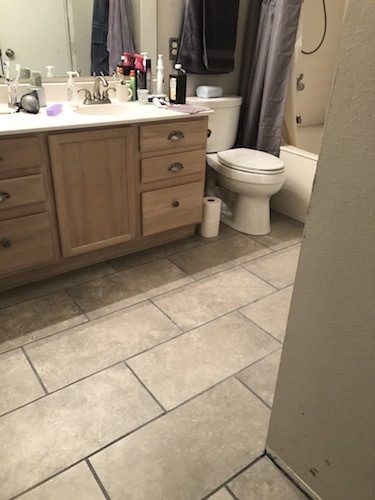 Vanity and toilet out, floors stripped, floors painted with Red Guard (a water sealant), new cement board down, tile, grout, etc before anything could be put back in. It took several days before we had a workable bathroom again, but it had to be done before the weekend because James was already scheduled for another job in Ohio for three weeks. His goal before he left was to get us a working bathroom situation and a temporary functional kitchen. 4 – Jason bought a utility sink and hooked it and the dishwasher up in the kitchen so that I could spend all of Monday running dishes through the washer. Just about everything we had got covered in plaster dust at one point during the demolition, so we were living on plastic plates and such. I spent Monday alternately washing dishes and organizing our living room so that we could 1) have places to sit down and 2) have access to the dining room table again. 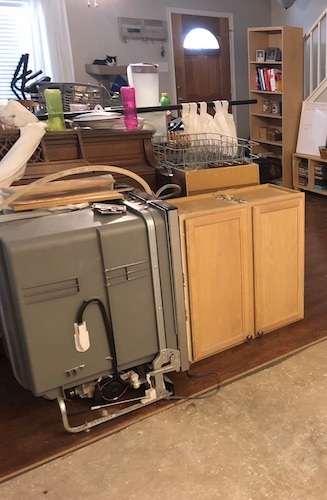 (Our kitchen cabinets, dining room pieces, and living room are all currently Tetris-ed into just the living room area – see above.) Then on Tuesday, James disconnected the utility sink etc, built a temporary frame for our old counter top, and put in our old sink so that we at least had a real sink, dishwasher, and some counter space (see below) to use until all the insurance stuff gets resolved and he returns from his Ohio job in a few weeks. 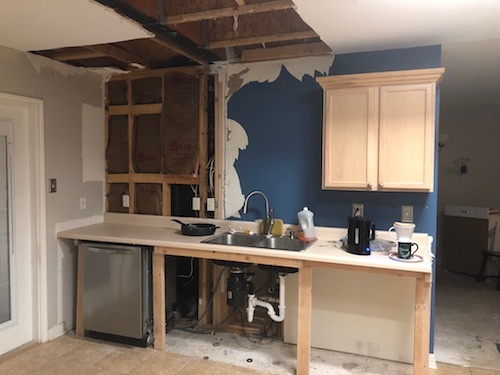 5 – In the meantime, James also updated our original Mother’s Day flooding claim to include the damage in the second upstairs bathroom per instructions from USAA. Apparently they’ve decided that the downstairs damage is due to roof issues but the upstairs stuff was water flooding under the tub and through the wall into the boys’ bathroom. Personally, I think it’s all due to the roof issue, but if amending the claim per their instructions make it easier on all parties, I’ll take it. 6 – James also fixed the structural damage in our kitchen before it caused part of the roof to collapse inwards. Literally the roof leak issues caused the studs on the load-bearing corner of the house to rot through at the bottom. Yikes. 7 – The roofers did come out Tuesday but failed to bring a neutral third party with them. They then tried to lie, belittle, gaslight, and otherwise weasel out of responsibility, hitting every one of our buttons, until Jason, James, and I were raging mad. James managed to deescalate the situation and he got the roofers ON VIDEO admitting fault and responsibility. And I definitely plan to hold them to that. After they lied to me and told me that we only paid for them to replace the undamaged part of the roof (WTF? ), I was just about ready to punch someone in the face. I do NOT like being lied to. 8 – Roofers came back the next day and told us that they wouldn’t do anything to help because none of this is their liability. They weren’t responsible for fixing the leaking roof we hired them to fix because it was under the siding that we also hired them to fix. They weren’t responsible for replacing the decking under the leak even though we paid for them to do so. They weren’t responsible for attaching the siding properly or fixing/replacing it despite us paying for them to do so. Etc. Then their general manager nearly punched our contractor (pulled back a fist and everything). So we began the long and tedious process of reporting them and filing complaints with USAA and the BBB, plus reviewing them negatively in every public space, retaining a lawyer, and contacting all the local news agencies. 9 – In the meantime, we finished putting in the tile in the master bathroom, which meant we could put in the vanity and toilet again. All the decorative stuff (paint, trim, etc) will have to wait until after James returns, but it’s SO nice to have a functional bathroom again (see above). Ugh. It looks like there is light on the horizon for you but with the way this saga is playing out, I feel like it might be too premature to start celebrating on your behalf. Those roofing guys sound like an absolute nightmare. I hope you take them for all they are worth after almost punching your contractor! Hang in there and try to have some fun with picking out new everything. And know that when it is all said and done, you are going to have a beautiful house. 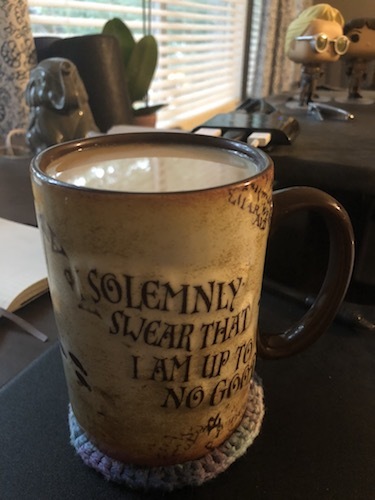 Until we finish the mediation with the USAA contractor people who guaranteed the roofers originally, we can’t do any of the news, legal stuff, BBB, etc. But as soon as that’s all done, I’ll be doing it ALL. I’m really sick of living in the middle of construction, I really am. Geez, that’s so awful, I can’t even imagine. Good for you for retaining a lawyer, recording everything, and contacting the local news. And I’m glad USAA is backing you up, I’ve used them for years and they’ve always come through for us. They’re mediating, but we don’t know the outcome yet. At this point, I wouldn’t let that company in my house again, not to fix the things we paid for them to fix, not to do anything. This whole situation is just so frustrating. I wish we’d know there were problems before we paid the second half of our payment to them back in Feb.
God, I commend you for not going completely mad. I think I’d be so overwhelmed but I really admire how you’re getting things done. Damn those roofers though. I only manage to get things done occasionally. With the boys out of school too, it’s doubly hard. I feel completely overwhelmed and there are days when I don’t want to do anything but stay in bed. I just don’t have that choice.